Fans of the Edgar Wallace krimis like me, who don't speak more than a few words of German, have been taught an exquisite form of agony by the Tobis/UFA box sets of Wallaciana that have been released, mit-out English audio or subtitles, over the past few years. (It's true that nearly all of the main Wallace sets include English audio or subtitles, but there is always at least one title per box that doesn't... and then they reached a point where they were withheld altogether.) But I learned years ago that, sometimes, you just have to jump into the deep end without knowing how to swim; it is cinema, after all, and dialogue should be secondary to a brilliant mise-en-scène, or whatever the German equivalent might be, and a stellar anamorphic transfer. Consequently, I've gone ahead and bought the German DVD sets -- not only of the Edgar Wallace and Bryan Edgar Wallace krimis, but also the Karl May Westerns, the Eddie Constantines, and the RAUMPATROILLE sci-fi series -- and, regardless of our "failure to communicate," I've derived a good deal of enjoyment from them. 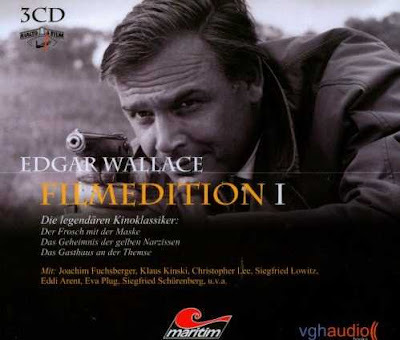 I recently rolled the dice again with my purchase of another Wallace-krimi collectable, a three-CD set called EDGAR WALLACE FILMEDITION 1. I couldn't quite tell what it was from the listing on Amazon.de, but I understood the chances were slim that I would derive too much satisfaction from it because it was a purely audio entertainment... auf Deutsch, natürlich. But being a collector, I had to have it -- partly to find out what it was, and partly because I had to have it. What this FILMEDITION turns out to be is a set of three Wallace-krimi film classics -- THE FELLOWSHIP OF THE FROG (1959), THE DEVIL'S DAFFODIL (1961) and THE INN ON THE RIVER (1962), to use their English titles -- whose original German soundtracks (featuring the talents of Joachim "Blacky" Fuchsberger, Klaus Kinski, Eddi Arent, Siegfried Schurenberger... and Christopher Lee (who spoke his own German in THE DEVIL'S DAFFODIL) have been adapted by the leute at VGH Audio into "audio book" format, with the addition of newly recorded narration by (as best I can tell) Joachim Kramp, author of the indispensible reference HALLO! HIER SPRICHT EDGAR WALLACE. It's an interesting little oddity, an attempt at crossover from Wallace fandom into the audio book market. As such, it's an important validation of how close these early Wallace-krimis were to their original literary sources before the scripts began following their own lead, not unlike the Bond films. I would have thought that these films would lose more than half their appeal if deprived of their imagery and atmosphere, but these discs assert the opposite view -- that the stories and performances are sufficient to sustain interest. Listening to all three discs (und ja, I'm crazy enough to have done this), I have to say that I'm as persuaded as I can be. This set is strangely listenable, even without a grasp of the language, because of the lively interplay of voice, sound effects, the terrific music scores, and the occasional woman's scream. It's also a pleasure to realize that I can recognize Fuchsberger's and Kinski's (and even Lee's!) voices in German, and -- bottom line -- one should never snub the rebellious thrill that comes with thinking to oneself, "I've got to be the only person in the country who's listening to this right now." One might expect a nice fat annotated booklet to accompany a set like this, but there is only a four-page (single folded sheet) enclosure with a few pictures and the major cast lists for the three films. Mein urteilsspruch: a neat little offbeat thing to have, and the price is right. Impress your friends... and maybe learn a little German in the bargain.